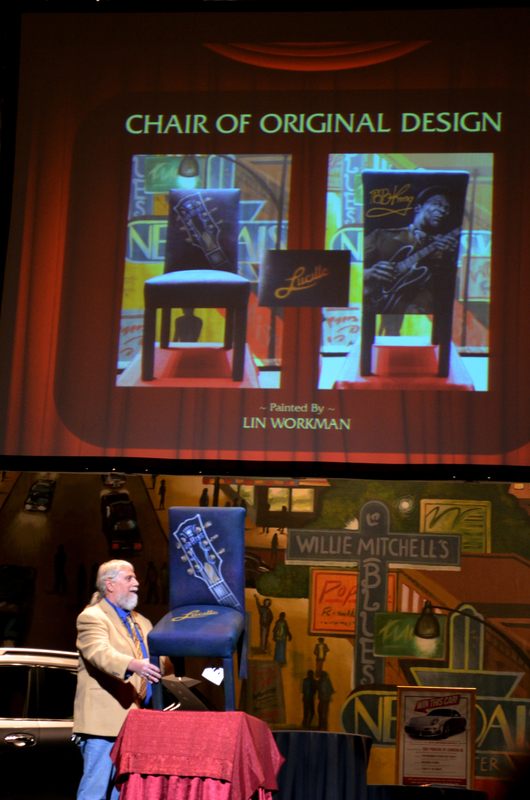 This weekend I had another of my airbrushed canvas chairs in the live auction at The Orpheum Theatre‘s 37th Annual Auction. 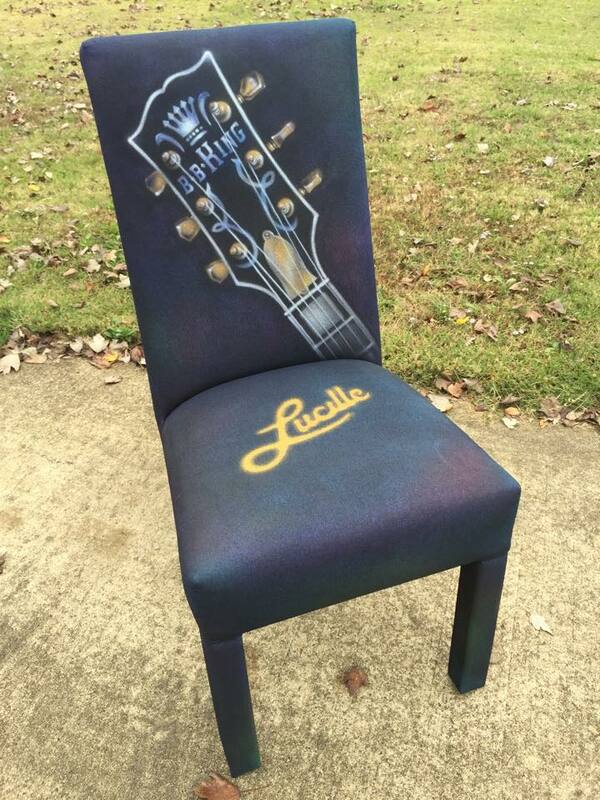 This is the 6th chair I’ve painted for their big auction. 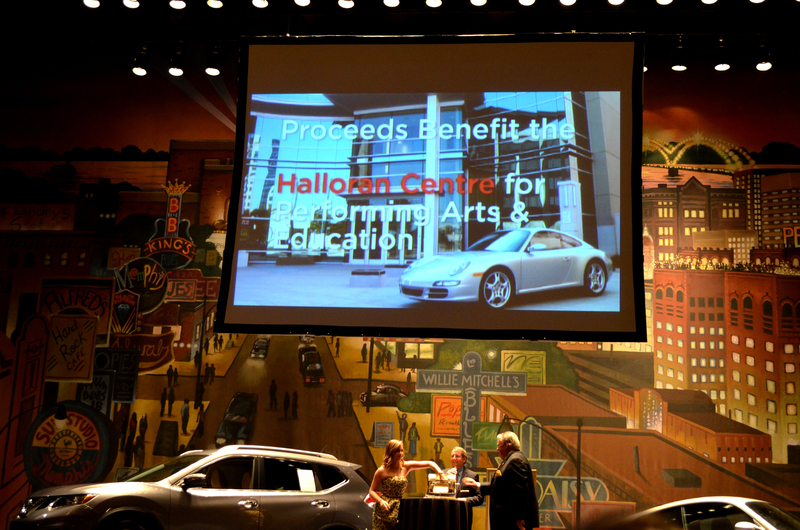 Proceeds from the auction go to benefit the new Halloran Centre For Performing Arts and Education (named after Pat Halloran). 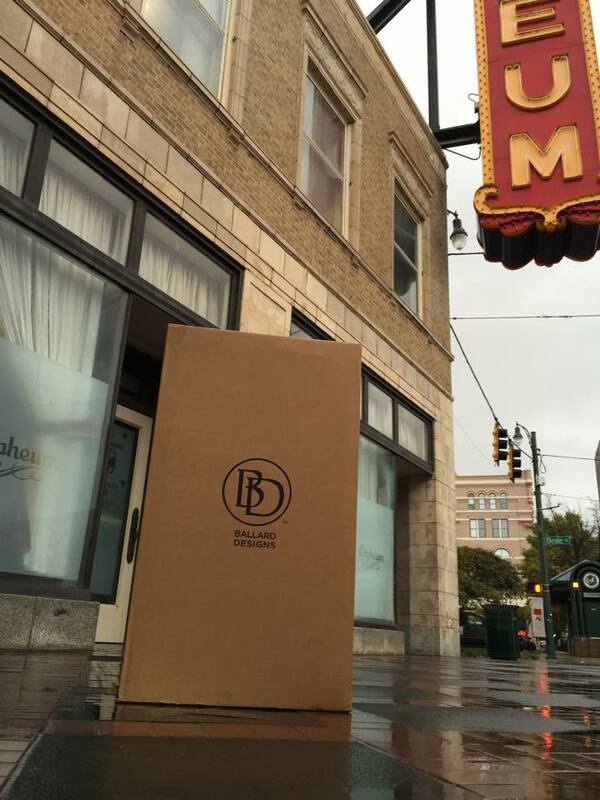 It’s next door to the Orpheum on Main Street just south of Beale Street, and is a extremely nice building. 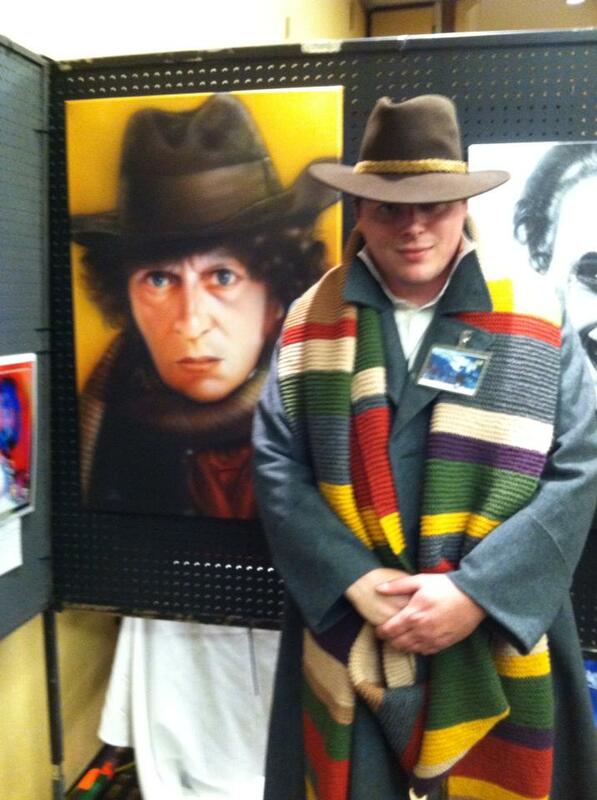 My wife Nicki said it reminded her of the TARDIS– looks bigger on the inside. That pretty much described it up for me, too. 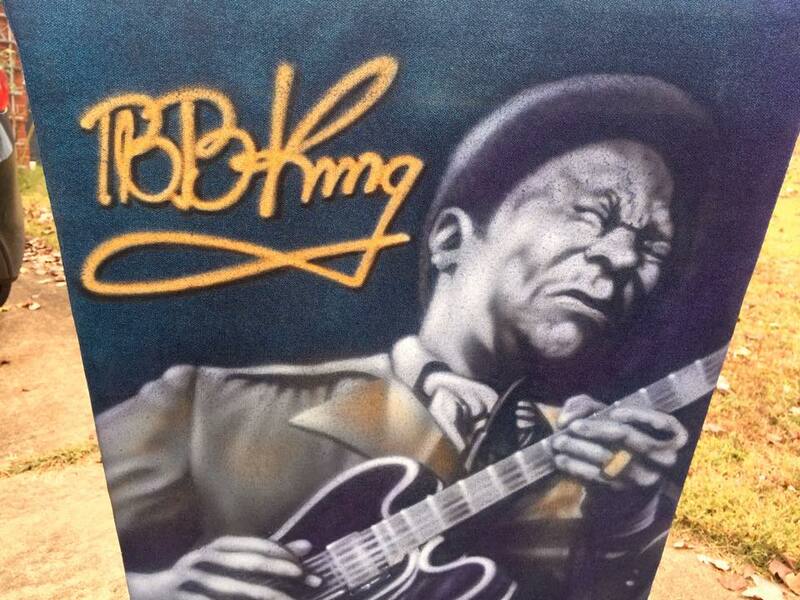 That’s the B.B. 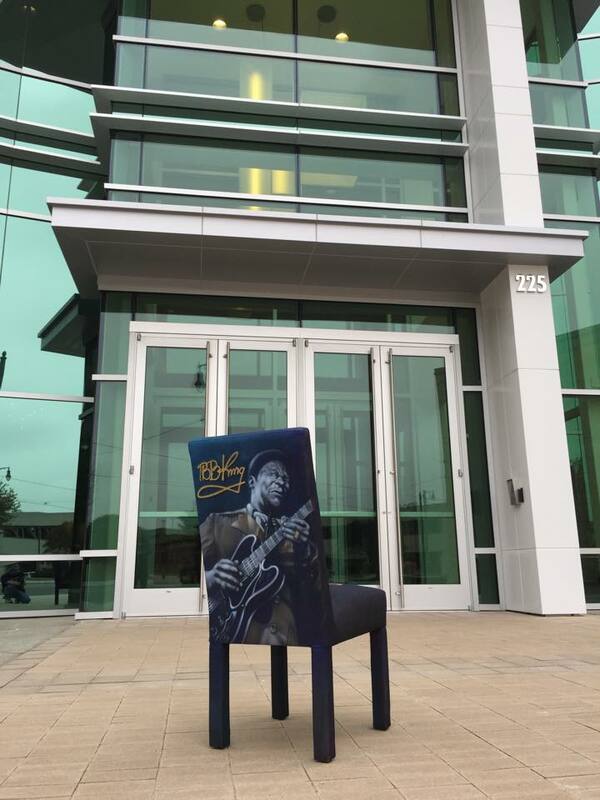 King chair in front of the building when we dropped it off last week. 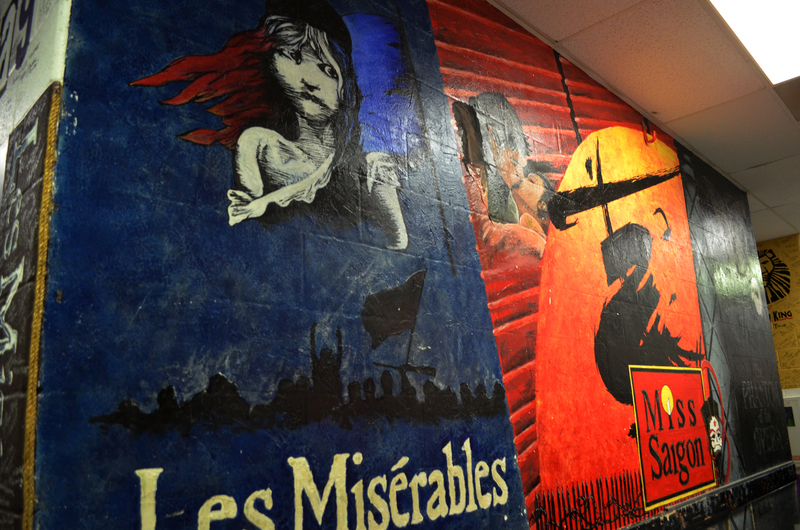 The Orpheum Theatre’s performing arts programs for students, teachers and families currently serve 70,000 annually. With our new state-of-the-art Halloran Centre, we will be able to reach thousands more. 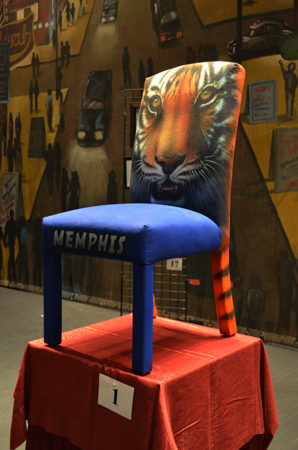 In the previous live auctions my Memphis chair went for $1200.00, my UofM Tiger chair got $1700.00, Wicked chair sold for $2,300.00, and this year the B.B. 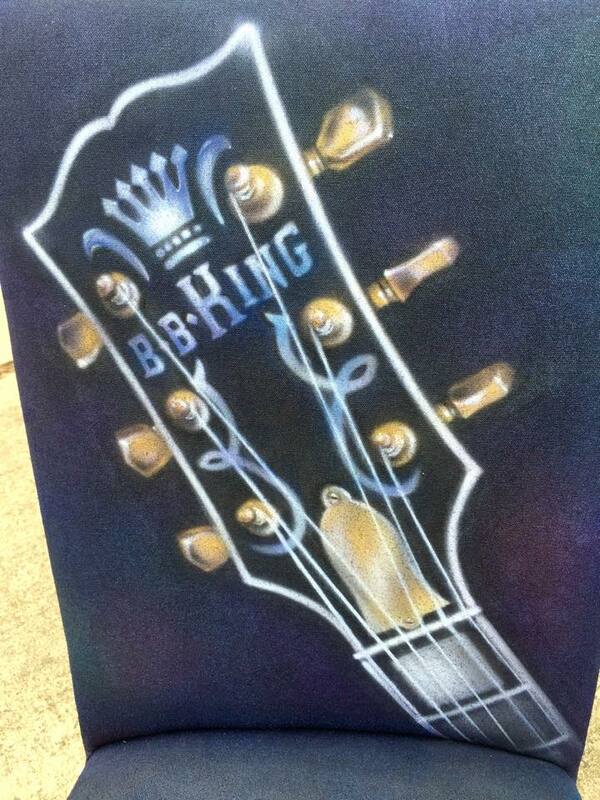 King chair’s winning bid was $2,600.00. 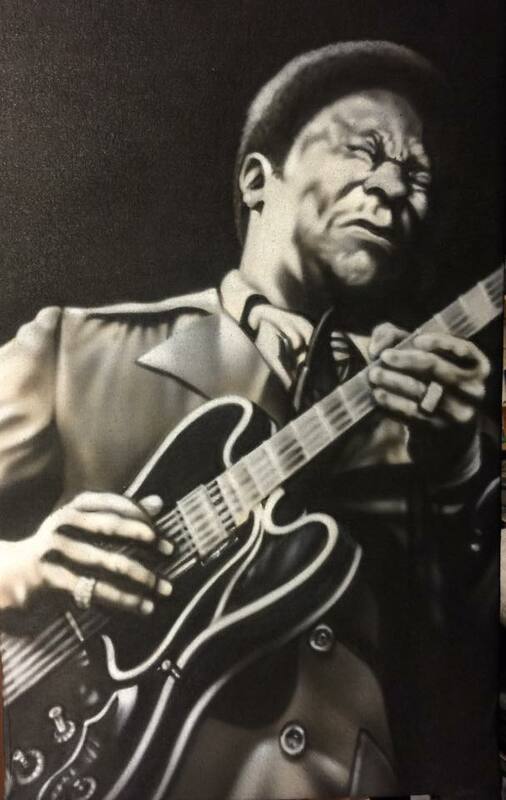 Other than a mural job I did for a casino in Tunica years ago, that’s the most any piece of art I’ve done has sold for. 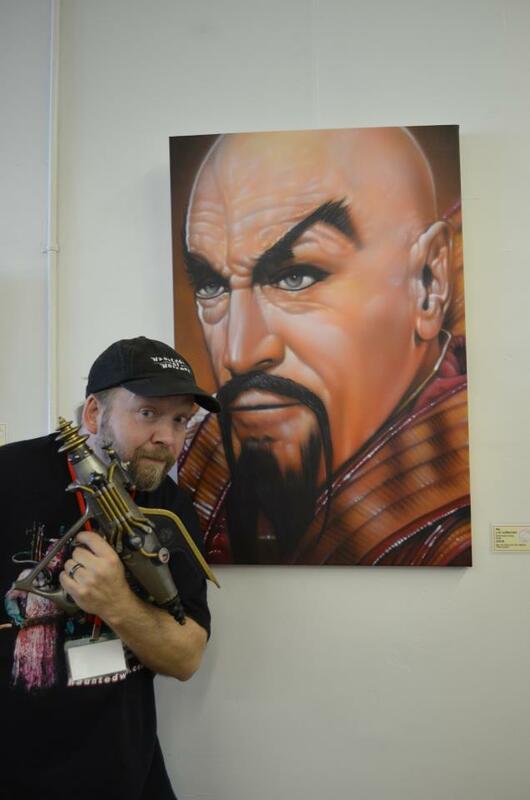 I think $750.00 is the most I’ve ever been paid for an original painting that wasn’t a mural. 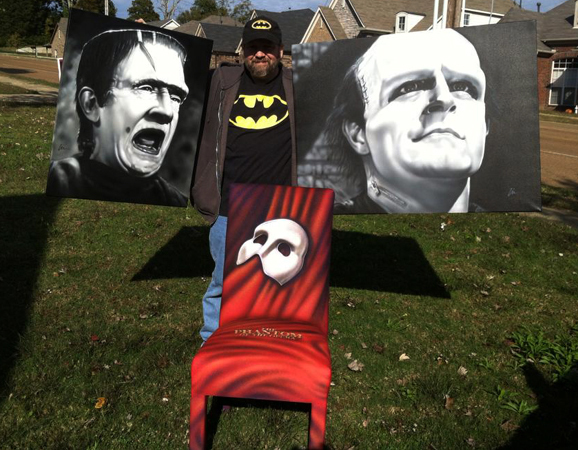 I’ve had two chairs in the silent auction (B/W movie “Phantom of the Opera” and the Broadway version) and I’m not sure what the final bids were on all of them, or any of the Monsterpiece paintings I’ve donated except Vincent which brought in $200.00a few years ago. All total, it’s around $10,000.00 my art has helped raise for the new performing arts centre. 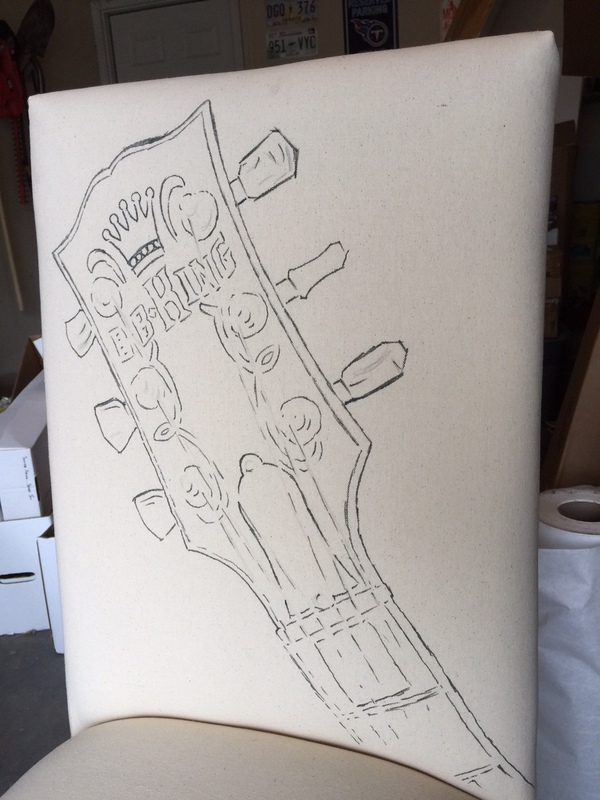 Not too shabby for a self-taught guy who draws left-handed. 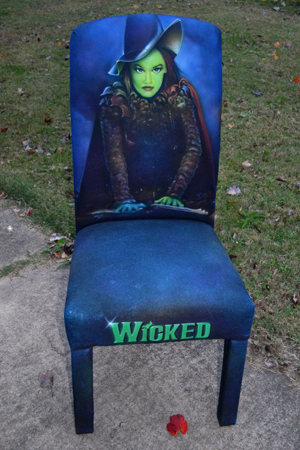 I picked up my blank chair for the auction about a month or so ago from the Orpheum. Was able to slide by one day after my day job…and of course it was raining. 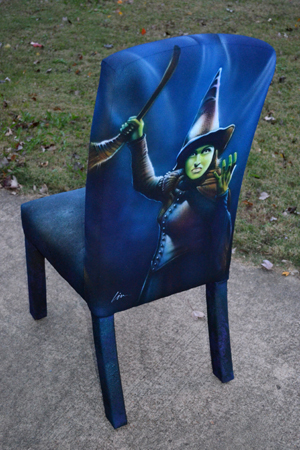 I started out by sketching off the images on the front and back of the chair. The chairs are literally a blank canvas. They are covered in a white canvas material, which takes the paint well- sometimes almost too well. 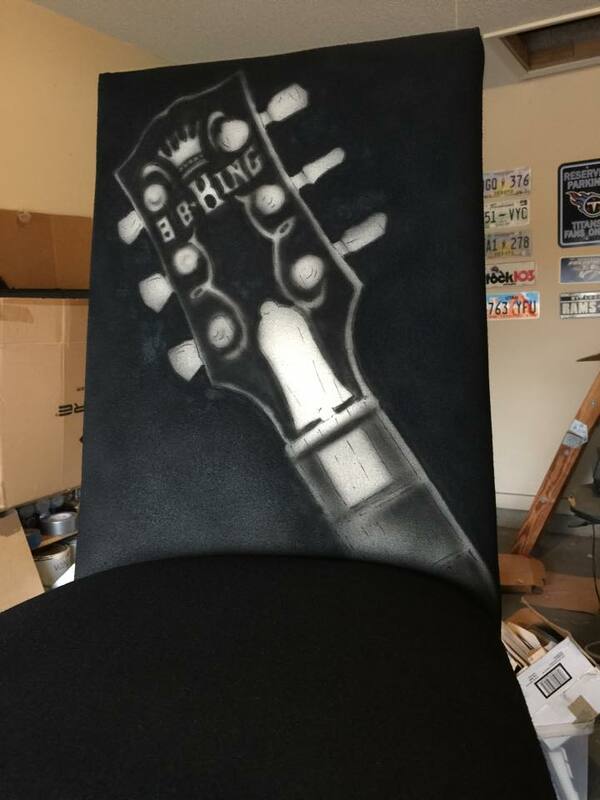 As I began to paint the rest of the chair black and start to define the sketches I was reminded that the hardest parts of one of these chairs are painting on a slight curve and getting the base color solid and even. It tends to want to have “high and low spots”, and highlights can be absorbed. I had to hit my highlights several times. 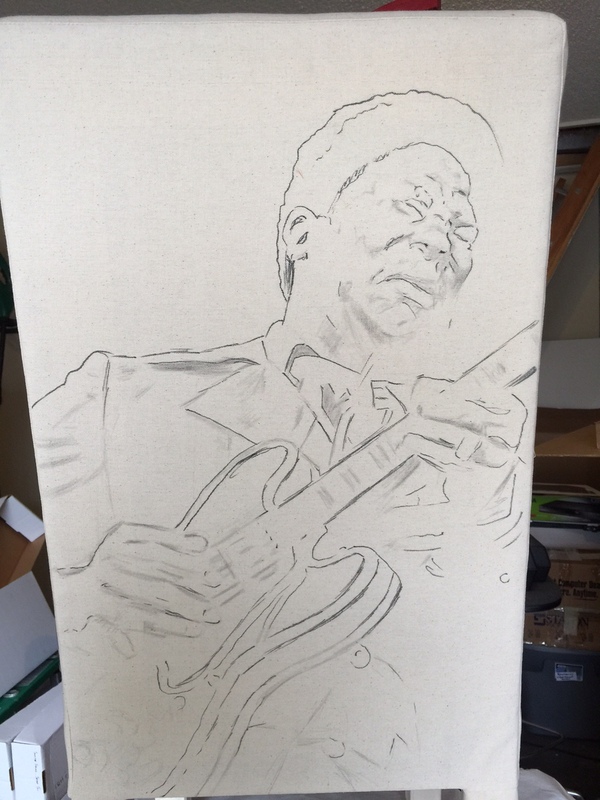 Once I got the drawing tighter using black, white, and grey, I started to add colors. 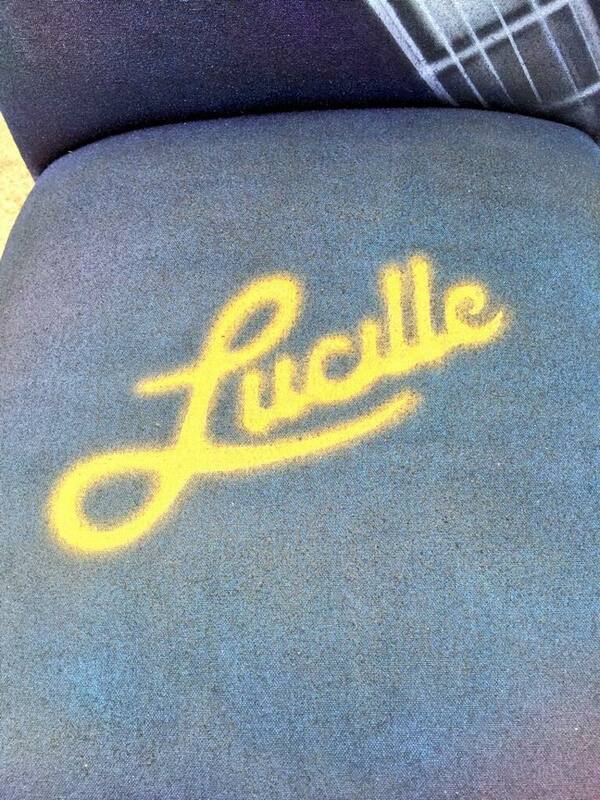 I used some painters tape to help keep my guitar strings straight and cut a paper stencil out of Bristol for the “Lucille” logo on the seat. Since the weather had been a bit cold and damp out and I paint in the garage, the paint took a bit to dry so I’d have to paint for a bit and then work on a different side or take a break. Once done I sprayed a sealant on it and used an iron to set the paint. You have to be careful and make sure the paint has air dried or you can run the risk of smearing your work when you run the iron over it. A heat gun could work, too- but I’m always afraid I’ll get too close or be in one spot too long and scorch or burn the material. 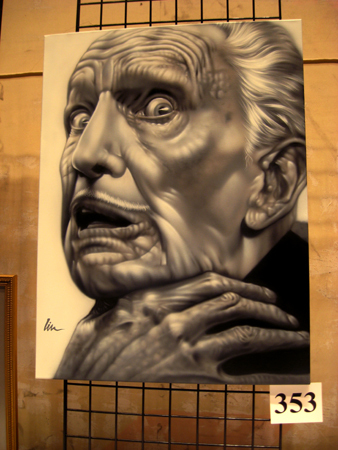 I use a Paasche VL-3 airbrush with Createx airbrush acrylic paint. 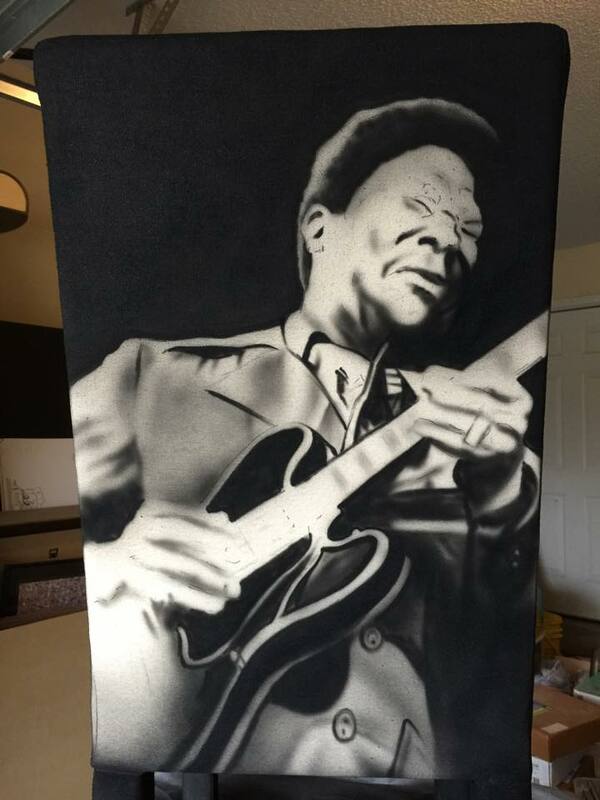 It’s water-based and comes ready to use, although you can thin it or add other additives to it to help with drying or adhesion. I used mostly Pearlized metallic paints for the colors, and tried to overlay them to create a cool color change effect when the lights hit it. I noticed on the Createx website that they make Iridescent Colors that have a color shift from a lighter hue on direct view to a darker hue on side-cast views, as well as some Auto-Air ones. Going to have to do some experimenting with them. 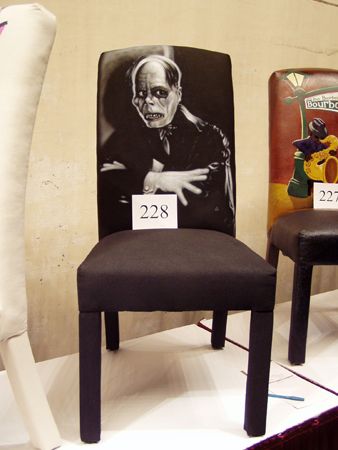 On one of these chairs and the different curved and angular surfaces the Iridescent Colors could work great on them. 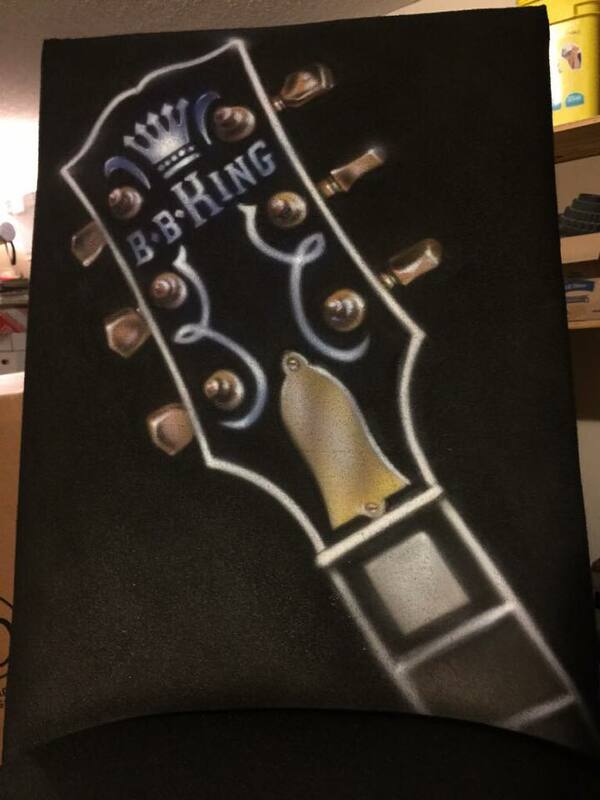 The Auto-Air paints could allow me to paint on other surfaces like guitars, metal, etc. for future art donations and personal art projects. 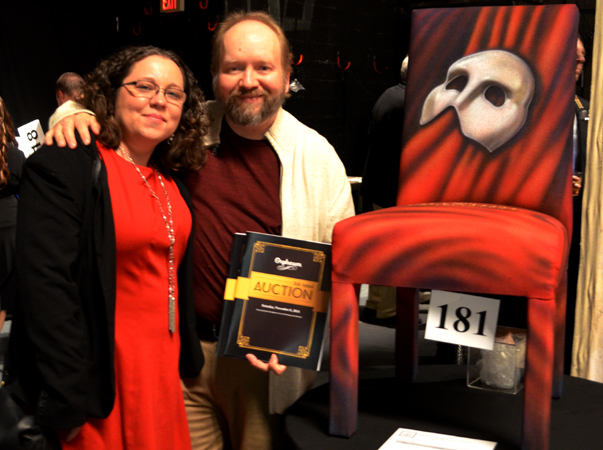 It’s hard to tell in the pics that these paints are metallic, but under the stage lighting they did look great as we walked around the chair at the auction. 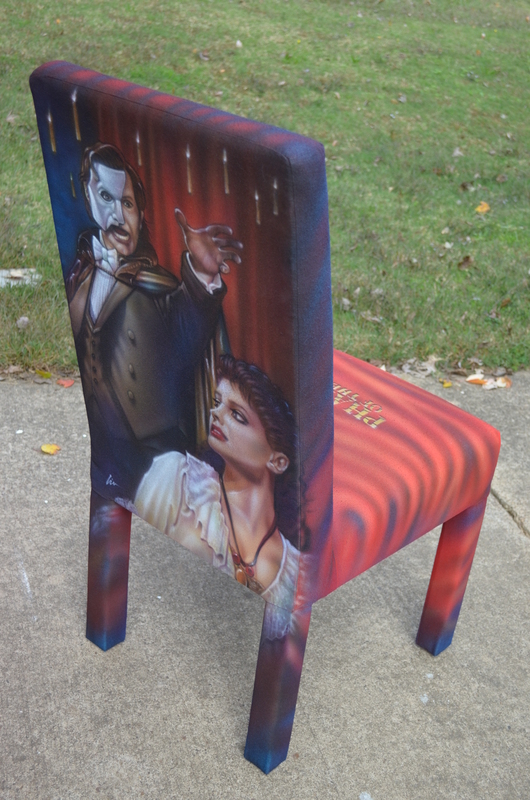 I used some of the same colors on my Wicked and Phantom chairs in the past, as well as my Ming The Merciless and Tom Baker/Doctor Who paintings. 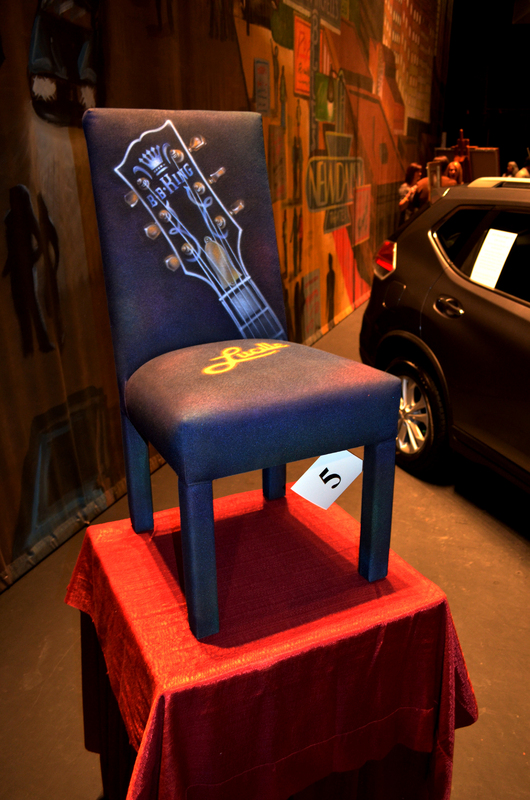 When we walked into the theater on Saturday night we could see my chair on stage to the left of the Nissan Rogue. 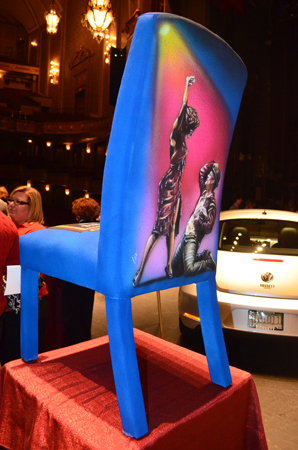 I don’t know who was more excited to see one of my chairs back on stage- me or Nicki. 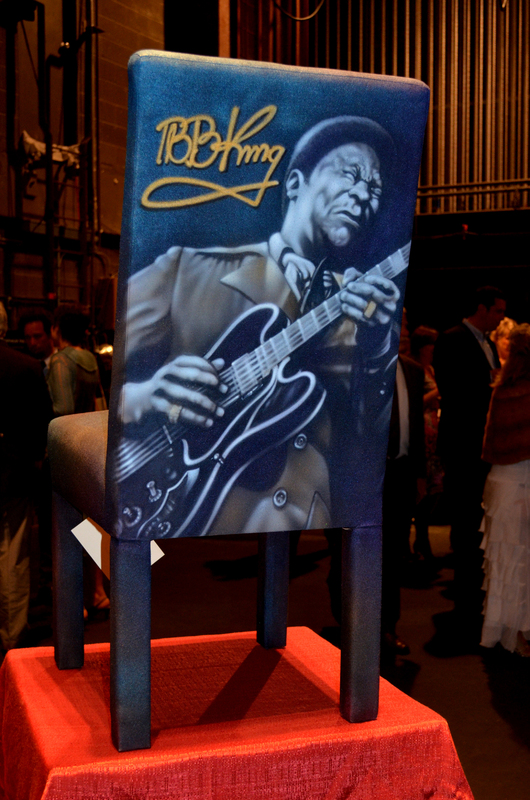 To have my work in the company of so many great Memphis artists is an amazing feeling, and to have it in a place like The Orpheum is, well- it’s a heck of an honor to say the least. I occasionally get asked to help out with charities and try to help out as much as I can, but this is one “CHAIRity” event Nicki and I look forward to each year. 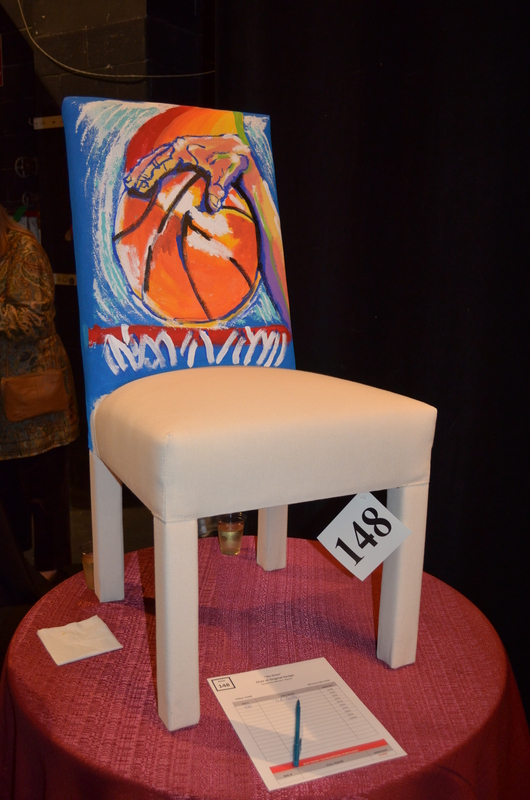 One of the volunteers there told me she had already talked to a few folks who were wanting to bid on the chair, which made me feel good. I never know how folks are going to react to them. 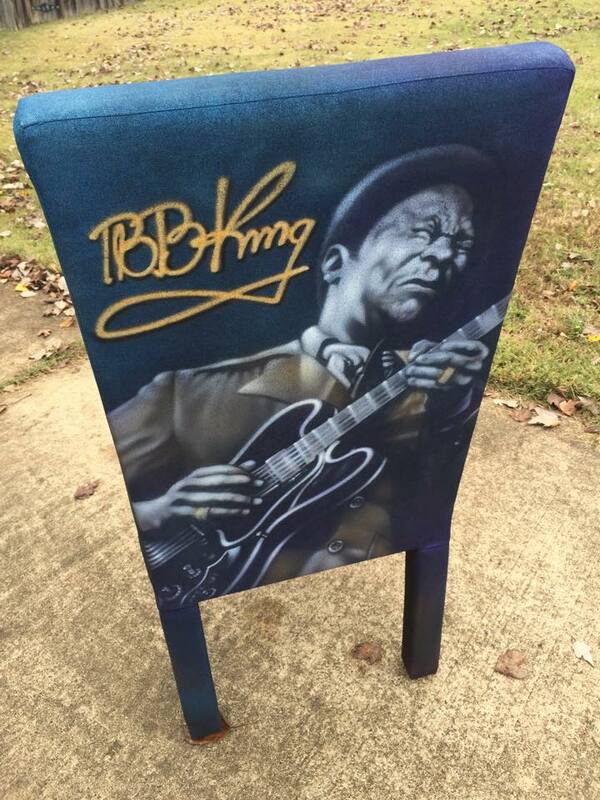 I was going to do a Memphis Grizzlies chair this year, but was told someone had already called dibs on doing one. Since this was Pat’s last year before retiring, they asked me if I could do something else Memphis related. I’ve been wanting to do some musician portraits, and B.B. King fit the bill perfectly for this project. We were on Beale, and his club is just a block east of the Orpheum. 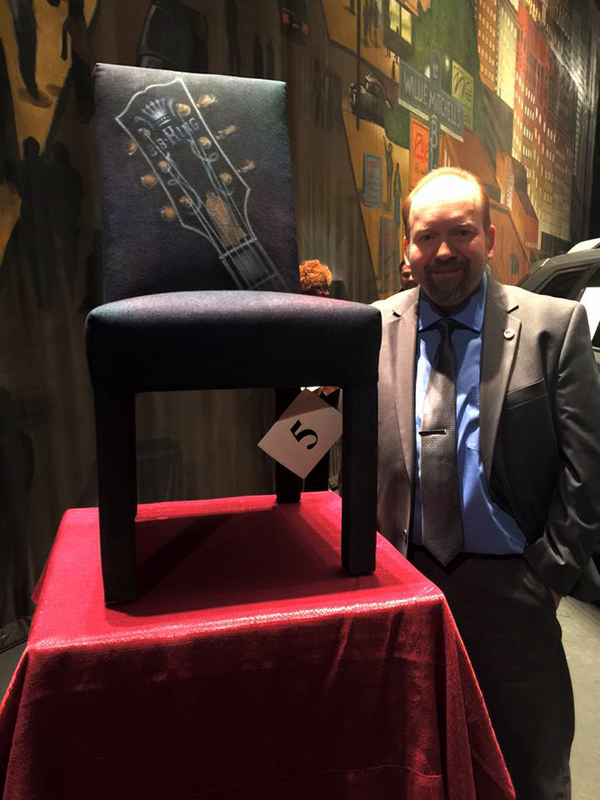 As we made our way to the left past my chair, there were two other chairs backstage in the silent auction- the Grizzlies chair by Michael P. Maness and a Big Star chair by Jeffrey Cannon. 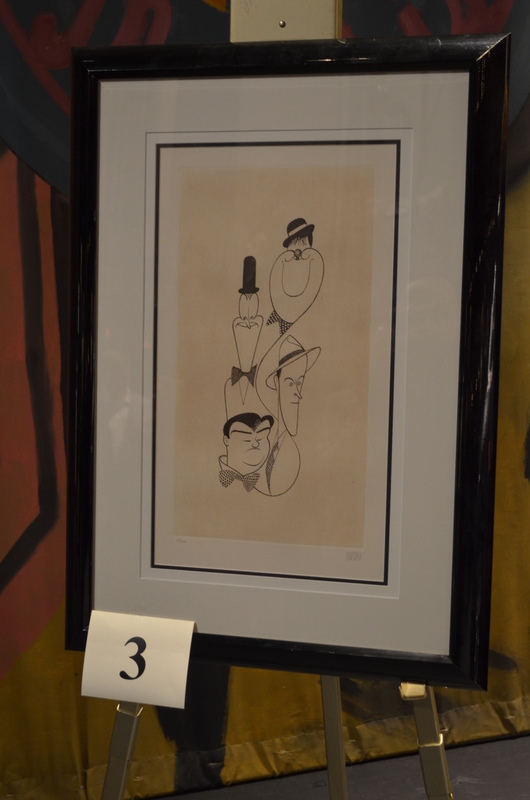 I dug these, and was pleased to see the lighting was much better in the silent auction area backstage this year. 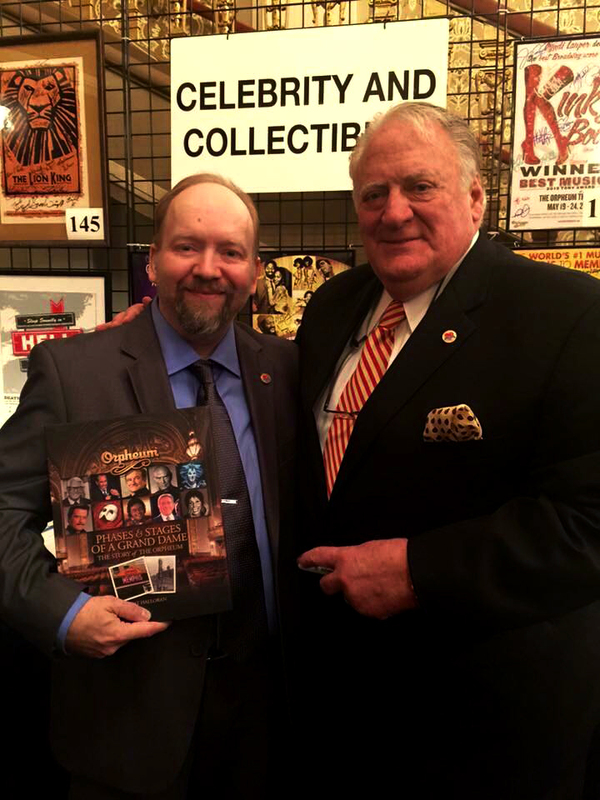 Got to talk to Mike and Jeffrey a bit before exploring more of the items up for bids. Mike had a lot of items in the silent auction again this year. Saw lots of paintings, framed prints and photos, signed posters, jewelry, sports packages, and more as we made our way around the backstage areas. 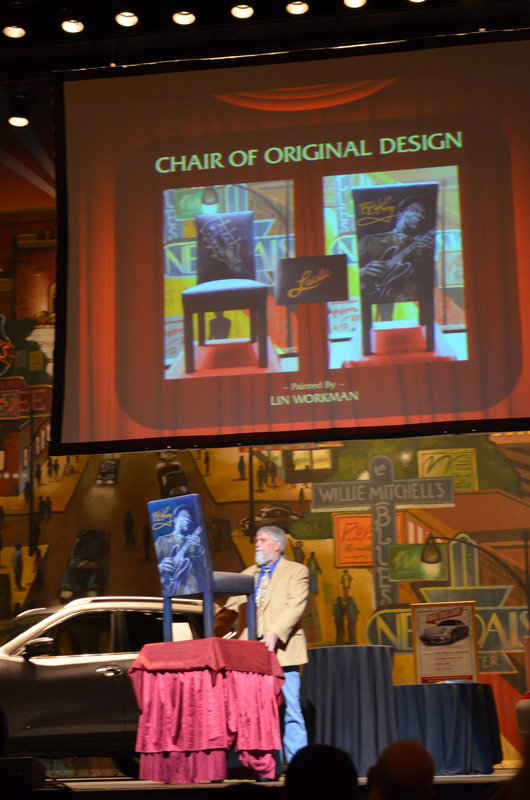 There was even a limited edition Al Hirschfeld print next to my chair in the live auction! How cool is that..?!! As we mingled there was lots of great food and drink to be had. There were open bars and food stations with meats. veggies, appetizers, and deserts. The cake from Frost Bake Shop was excellent. 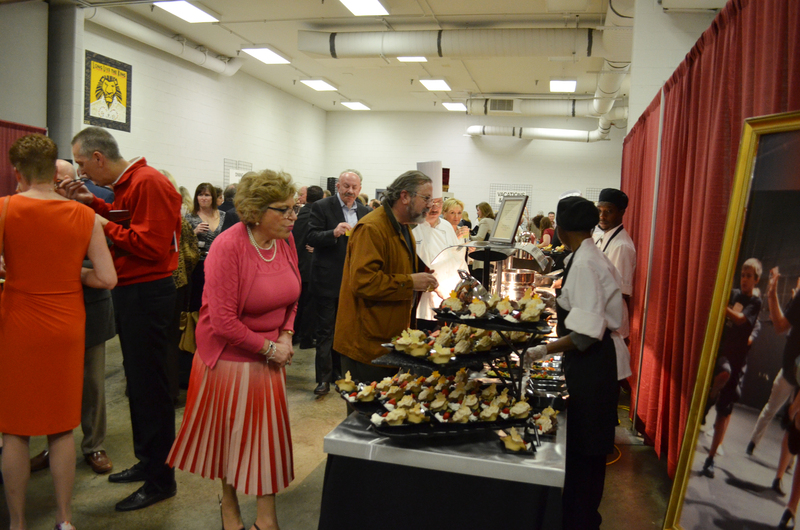 We had enjoyed some of their mini-cupcakes at one of the last Orpheum events we had attended. One of the things I love about going backstage at the Orpheum is getting to see all the murals from the shows that have been performed there. Some of the shows I had seen, some I wanted to see. If you haven’t been to The Orpheum to watch a play, musical, ballet, band, or movie you really should. The place is gorgeous and we always have a great time. It was about time for the live auction to start so we made our way back out front and found some good seats. 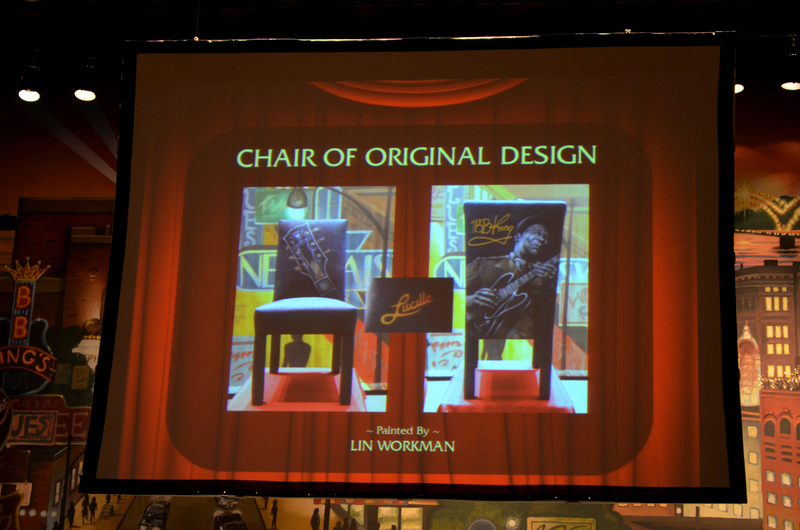 My chair was the 5th item listed in the program’s schedule for the live auction that night. I always get a bit nervous when they wheel it out for auction. This year was not different, especially when the bidding didn’t start off well..or at all. The auctioneer asked for an opening bid of $1000.00, but didn’t get it, so he dropped it down to $750.00, then again to $500.00 when there were not takers. Finally someone bit at $500.00 and then it was on! 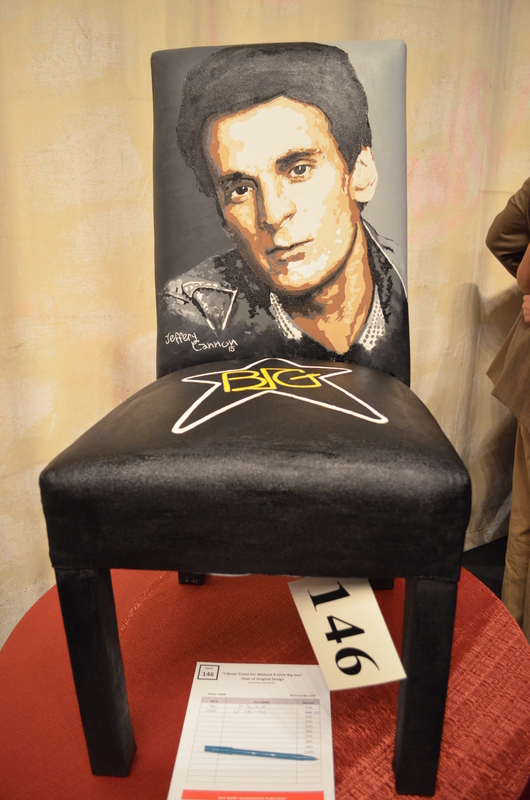 A bidding war started and before we knew it the chair was going for over $1000.00, then $2000.00..! 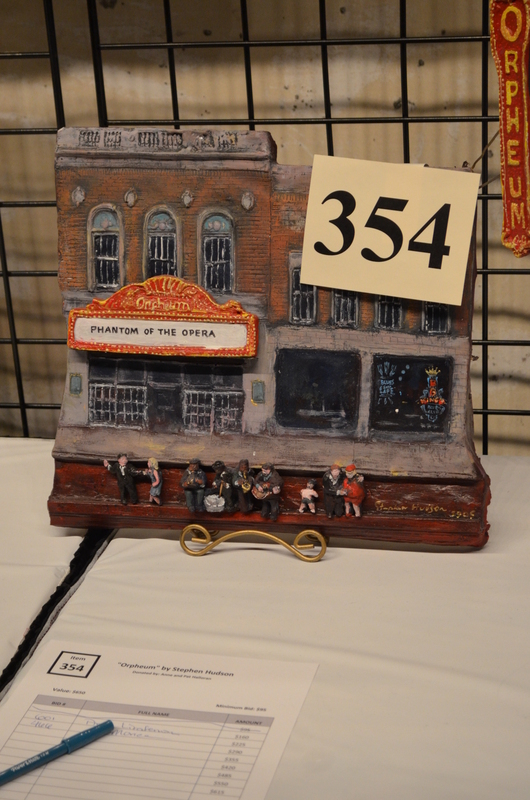 I looked up at the stage and saw Pat Halloran giving me the “thumbs-up” sign when it finally went for $2600.00! Whew…I could breathe again!!! The auction went along quickly from one item to the next. 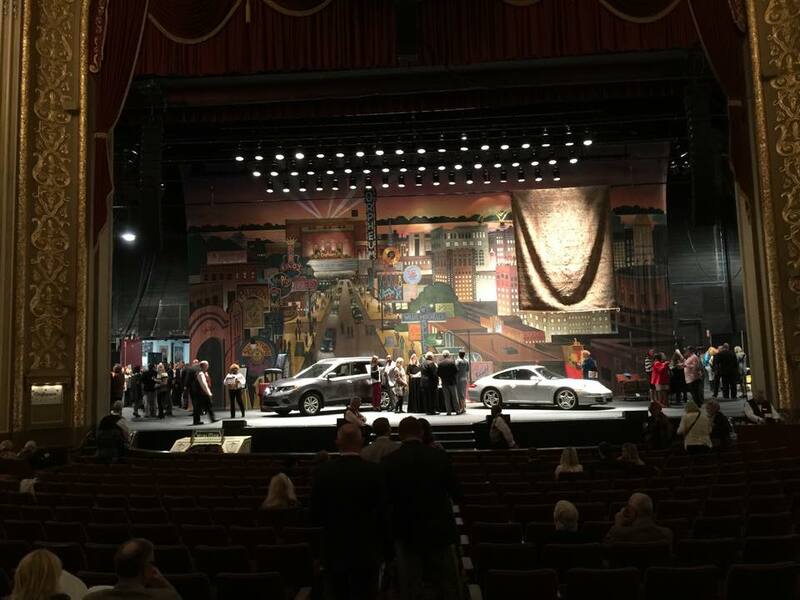 There were 19 items in the live auction this year- trips, tickets, dinners, a Persian rug, jewelry, a fur coat, a LARGE abstract painting, actual Orpheum seats from the restoration, and even a car. Nicki was really tempted to bid on a couple of the trips which went for a steal. Having dinner with Pat and Anne Halloran at their house would be cool. Pat has collected some of the past painted chairs and has them in their dining room and is known to have one heck of an art collection. He also knows a lot of great chefs! 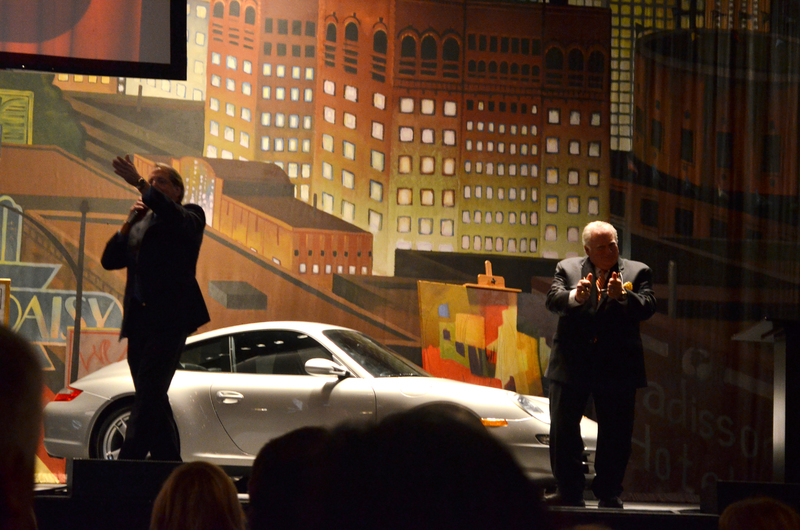 The auction ended with a raffle where the grand prize was a Porsche..! 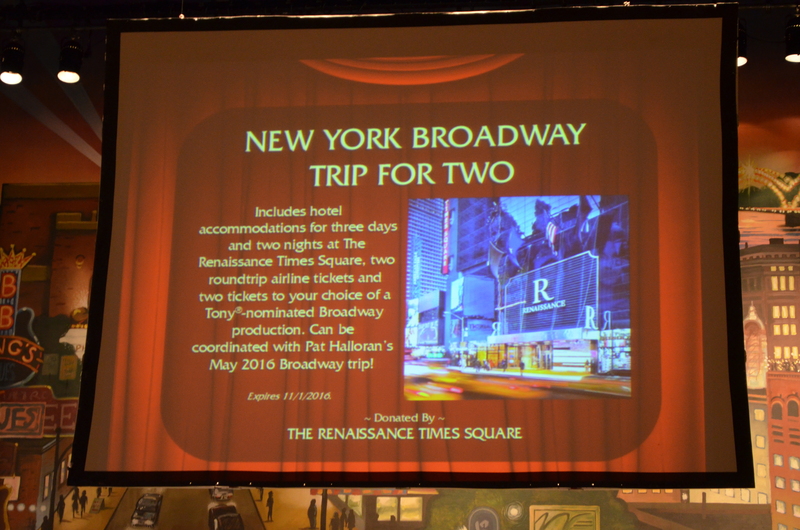 Some of the other prizes included season passes to the Orpheum. The tickets were $100ea, and tax deductible. Nicki and I didn’t leave the auction empty handed. 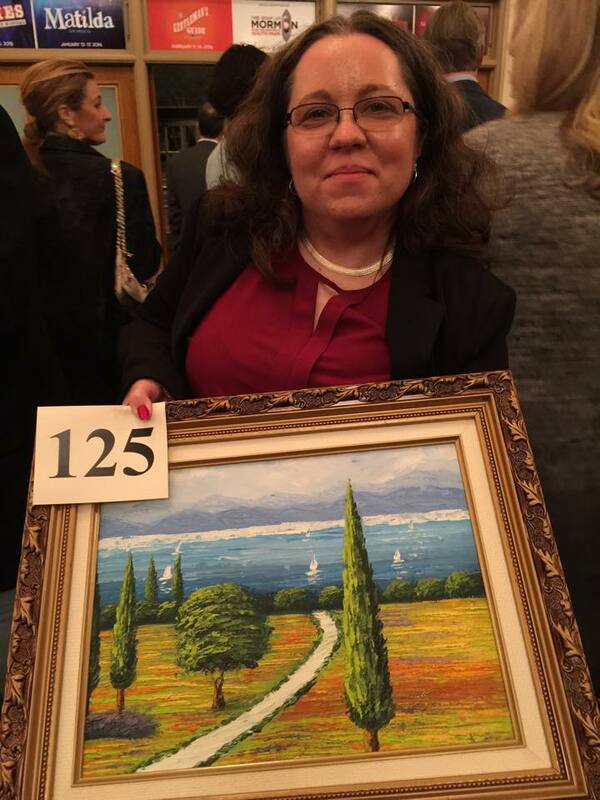 She won an oil painting in the silent auction, and I bought one of Pat Halloran’s Orpheum books. 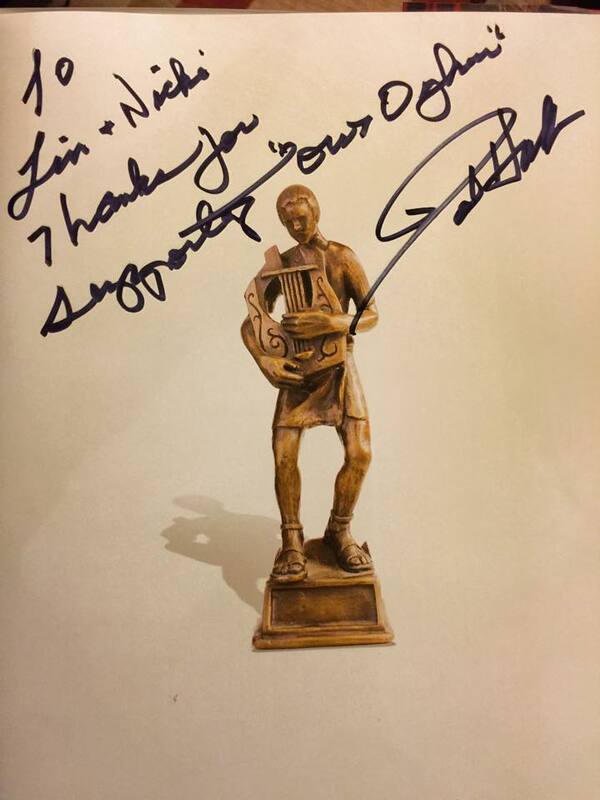 Ran into Pat just before the auction so I was able to get him to sign my copy for us. 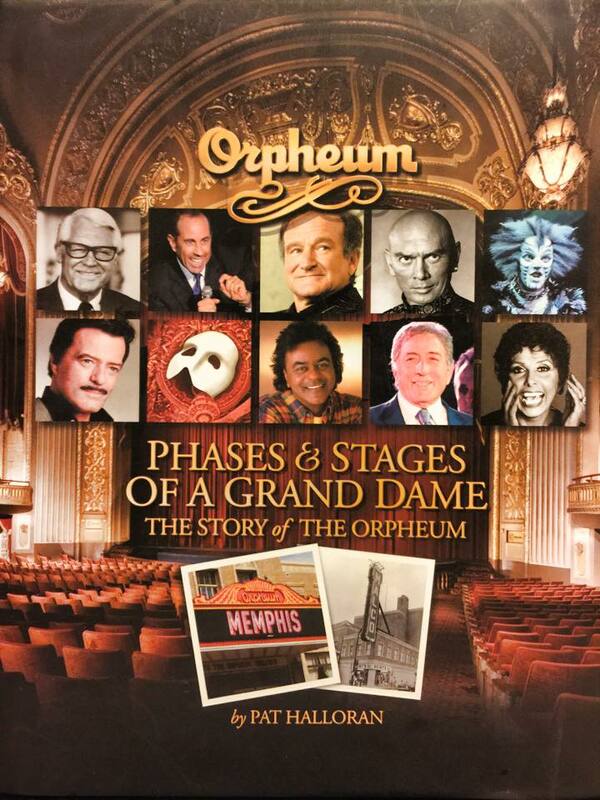 It’s got some great old shots in it, and can’t wait to read it to learn more about the history of the Orpheum. Was glad I got to say hi to him at his last official auction before retirement– although I know he won’t be able to stay away. I’ve really enjoyed working with him and his staff over the years. They all couldn’t be nicer. 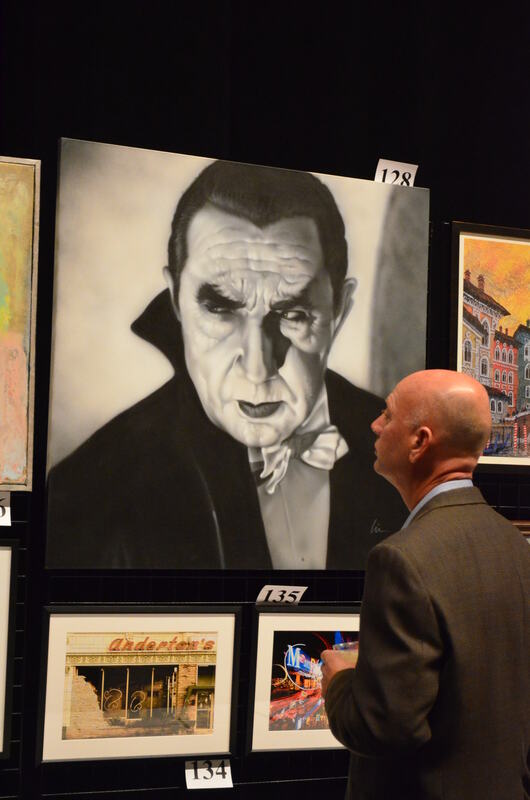 They’ve had me be part of auctions that benefited artists and even invited me to do a one man art show “Scared Silly” in their lobby which featured a “macabre mix“of my Monsterpieces and Scared Silly toons during the run of “The Addams Family“. 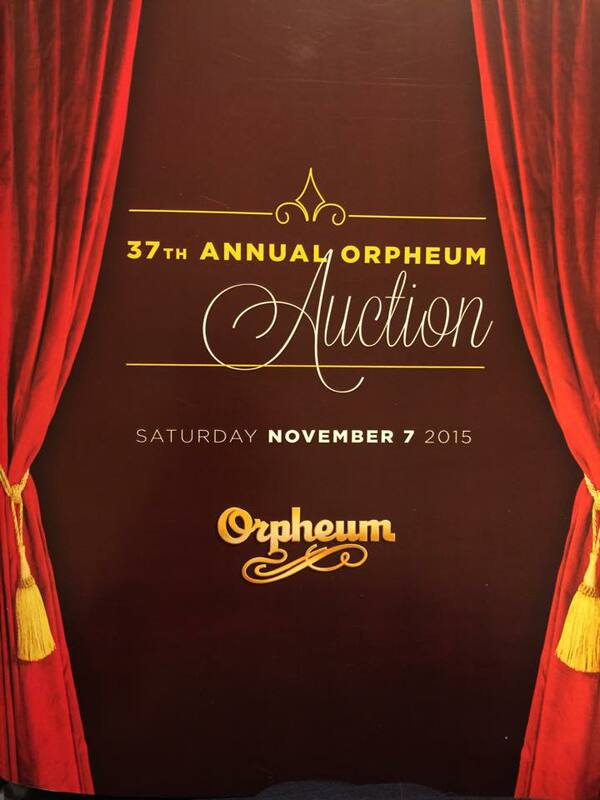 Thanks again to Pat and all of the Orpheum staff and volunteers. 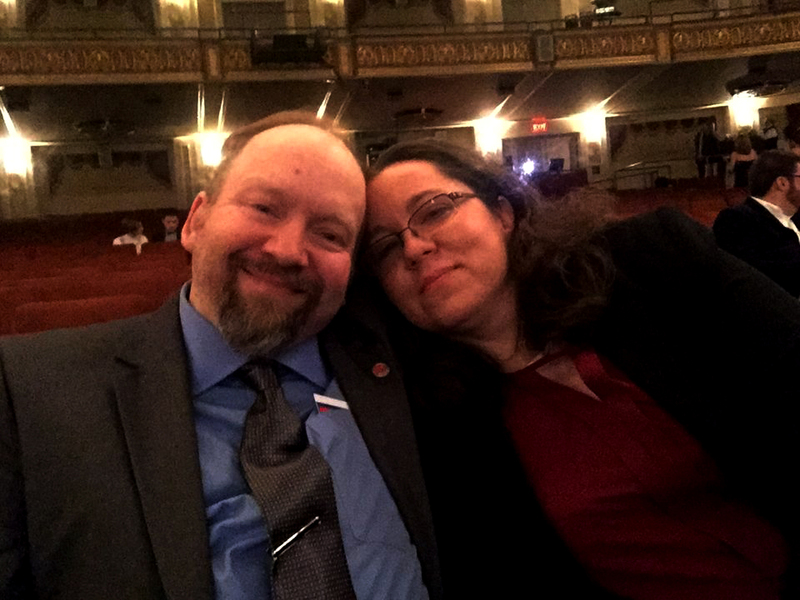 It was another great date night for us, and we enjoyed cosplaying as grown-ups again! 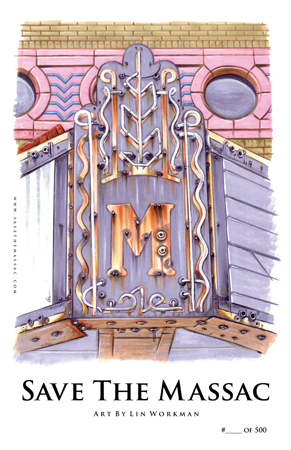 Oh, there’s another great old theatre I love supporting and that’s the Massac Theatre in Metropolis, IL. It was built in the late 1930s, closed in the late 1970s, and sat vacant for years and was extremely neglected. The roof had caved in, stray animals had taken up residence in it, and even a tree was growing in the middle of the building. It was slated to be torn down due to it being an eyesore and possible public hazzard. 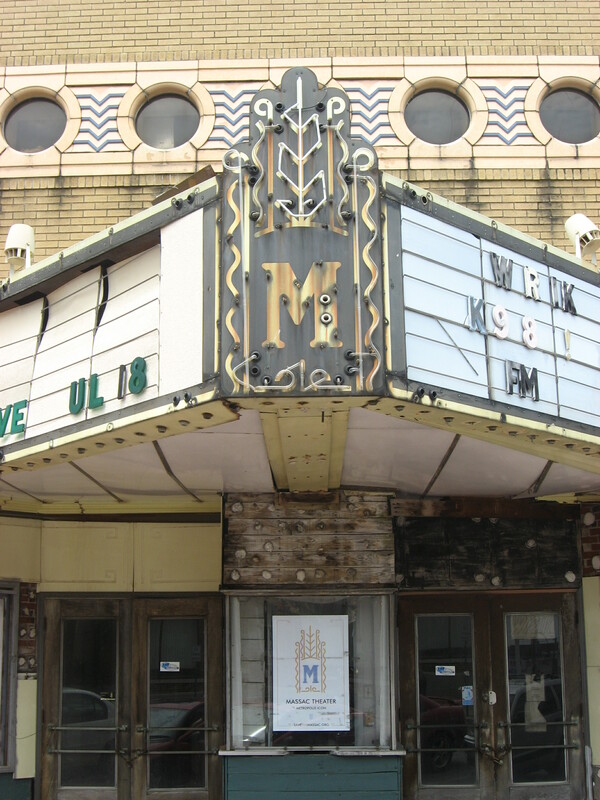 Once the city took possession of it through eminent domain the local group “Save The Massac” was formed and steps were taken to save the great landmark (and only movie theater in the small town). A study was done to see if it was even possible to save it, but like the say, “They just don’t make ’em like that anymore!” The study found that the “bones” of the building were sound. Once the tree and debris were removed (and resident cats found new homes) they discovered that the floor/foundation was in great shape as well. A new roof was added and fund raising efforts are still going on. It’s going to take some time, but at least now The Massac is getting the attention it has desperately needed for years. It will become a multi-purpose theater for many local events. Looking forward to someday soon being able to attend some of those events there during their annual Superman Celebration. ← Back in the saddle (stitch) again!